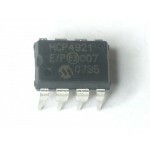 Purchase online MCP4821 12bit Digital to Analog Convertor in India at low cost from DNA Technology,Nashik. MCP4821 is a single channel 12-bit Digital-to-Analog converter (DAC) with internal voltage reference. This device offers high accuracy and low power consumption, and is available in various packages. Communication with the device is accomplished via a simple serial interface using SPI protocols. 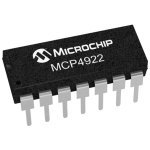 The MCP4821 device is a part of the MCP4801/MCP4811/MCP4821 product family, which are single channel 8-bit/10-bit/12-bit DACs with internal voltage reference (VREF). These devices provide very high accuracy and low noise performance, and are suitable for consumer and industrial applications, such as set point control, offset adjustment and sensor calibration applications. The low power consumption and small package options make these devices very attractive for many portable and battery-powered applications. 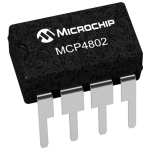 If two outputs are needed then the MCP4802/4812/4822 dual channel product family can be used. 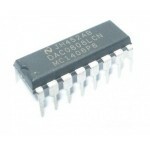 DAC0808 8-bit DACDAC0808 is a 8-bit Digital to analog converter (DAC). 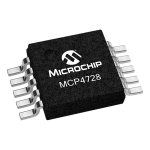 It can be easily interfa..
MCP4921 12-BIT DAC12-Bit Digital to Analog Convertor with SPI InterfaceThe MCP4921 from Microchip is..
MCP4922 12-Bit DAC with SPI InterfaceMicrochip's MCP4922 is a dual channel, 12-bit DAC with an exter..
MCP4802 8-Bit DACMCP4802 is a dual channel 8-bit Digital-to-Analog converter (DAC) with inter..
MCP4728 Digital to Analog Convertor SMDMCP4728 is a quad channel, 12-bit voltage output Digital-to-A..